« Cancelled GeoCities – Finally! Tricia over at Blogging Away Debt has been making bread lately, and I was inspired to pull out our breadmaker and make a loaf myself. 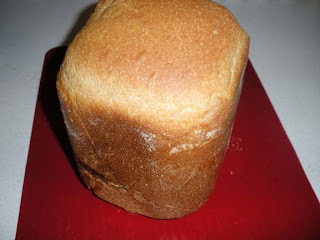 Tricia said in her first post that she figured the loaf cost less than store bought, but today she factored in how much electricity her oven costs along with her ingredients. As Mr. A, AJ and I were playing a board game after church, it dawned on me that Tricia is probably using little packets of yeast!! They are VERY expensive! If she’s going to be making bread on a regular basis, she needs to buy it in bulk. Alton Brown prefers Instant Yeast for his pizza recipe. We buy our yeast from Smart and Final, or Costco. These stores also carry bread flour in larger amounts, which end up being cheaper than buying 5# at a time from the grocery store. If I’d been planning to make a post out of making a loaf of bread, I’d have plugged my breadmaker into my Kill A Watt Electricity Usage Monitor to see how much electricity it used for the 3 hours it was plugged in. But alas, I didn’t. I picked up my breadmaker from a thrift store, and the manual was missing. I always see breadmakers at the thrift stores, selling for $5 to $10. Never buy a new one! I am sure a breadmaker uses less electricity than a standard sized electrical oven. 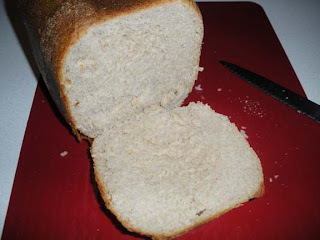 Anyway, if you do decide to pick one up the next time you are thrifting, and the manual is missing, here is one solution: The Hillbilly Housewife’s Bread Machine Basics – a great page which will help you figure out how to use your breadmaker. You could also try contacting the company that made the breadmaker – hopefully they will have the manual available online. Desserts from Your Bread Machine has THE most awesome donut recipe. Killer donuts. I promise you’ll never eat another one from the bakery again. Just one thing you must do… make sure all your ingredients are very fresh, especially the baking powder and soda. Oh, and fry them up in virgin coconut oil and they’ll actually be healthy for you! I don’t make donuts very often, this photo is from a batch I made back in 2005. How Much Do You Care About Expiration Dates? That bread looks delicious! can I ask which make and model of breadmaker you have?